iJust 2 atomizer features 5.5ml huge liquid capacity despite its light weight. With dual coil EC head of 0.3ohm, it can handle up to 80W and make large cloud production; when using EC TC head of pure cotton wick, it is compatible with various temperature control batteries and can be used within a wide range of wattage from 30W to 60W. The special structure design for iJust 2 atomizer standard base also improves the heat dissipation capacity to a large extent. The iJust 2 (TC)atomizer is specially designed for the iStick Battery(30W, TC 40W, 50W, 100W) . The combination of both will make the best of your vaping experience. 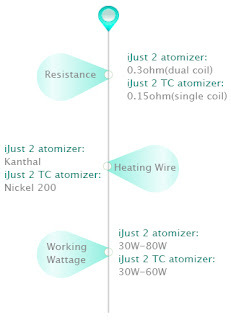 By follow this picture, you can know the different about iJust 2 atomizer and iJust 2 TC atomizer. 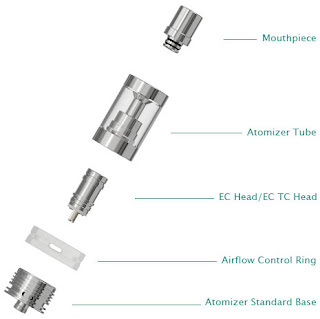 Whether is EC Head or EC TC Head, Cause your product name is iJust 2 atomizer or iJust 2 TC atomizer. So from this picture you can know iJust 2 TC atomizer is different from iJust 2 Atomizer, The max working wattage of iJust 2 TC atomizer is 60W, but iJust 2 Atomizer is 80W. with this, their battery request are different, iJust 2 Atomize With iStick 100W, you can enjoy a powerful vaping experience, and iJust 2 TC atomizer maybe only need iStick 50W, you can also enjoy a powerful vaping experience! You can buy it depend on your battery's version. I still recommend iStick 100W match with iJust 2 TC Atomizer! Buy I'm sorry, You can only buy iJust 2 TC atomizer at our site now, If you need iJust 2 Atomizer, you can buy it at other official authorized online site first!